We have lots of tips and guides if you’re thinking of starting a business online. But in this article, I’m going to tell you what not to do. Listed below are the five most common mistakes people make when starting a business and running it. 1. All product, no vision. Before starting a business, figure out why you want to do it. Specifically, what is your vision? What is your mission? If you have a vision, figure out what customer problems you can solve within the scope of that vision. That will give you your mission. Example: ISRO’s products are spacecrafts, but that’s not why the organisation exists. ISRO was established with a vision of demonstrating India’s space research, technology and exploration capabilities to the world. Their initial mission was to end India’s dependence on other countries for launching satellites. Now that’s over and done with, so their new mission is about landing on Mars, a race wherein ISRO is hotly competing with other space organisations from the U.S., China, EU and other advanced nations. Note that the vision remains the same, even though the mission and products have shifted as the organisation grows and matures. The takeaway here is that if you start a business with a product and no vision, it won’t take you very far. How to come up with a vision, and how to create a mission statement? Read this guide. You now have a vision, a mission statement, and a product that helps you carry out that mission. You know your product can solve a customer pain point or problem. But the thing is that your competitors are also able to do all this. What is it that differentiates your product, business and brand from all the others in the market? Specifically, what is your Unique Selling Point (USP)? Try coworking at Evoma for one day – Free! Evoma coworkers get more than just space. Since the coworking space is located in and part of a larger network of Evoma business centres in Bangalore, you also get access to an ecosystem of startups, big companies and highly successful business leaders who can help you grow your business very fast. Many new businesses create products, marketing materials and website content based on their own knowledge of their own product. You end up with a product that you want or need, and a website that explains everything you know, or might want to know, about your product. The problem is that you are selling your own product to yourself, instead of focusing on the wants and needs of your customers. That’s what you need to do to in order to attract website visitors and get them to buy your product. Example: Evoma offers serviced offices at our Bangalore business centres. We created buyer personas for ourselves, and one of them is an entrepreneur who is thinking of starting a business. 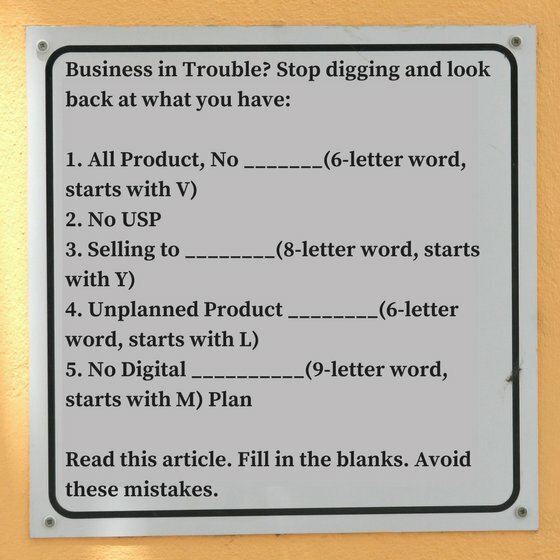 So we’re writing articles like this one, offering to help people who need to know what mistakes to avoid while starting a business online. Makes sense, doesn’t it? More than anything else, timing makes a huge difference in deciding whether your business will succeed. Netflix was too early the first time round, and they’re too late now to take on iTunes and others who filled the gap when the timing was right. First-mover advantage (FMA) may not always work if the market is not ready for you, but otherwise the longer you wait for your official product launch, the further away you get from your initial business plan. What you need is a product launch checklist and plan. Just go through this slideshow below, and you’ll know what you have to do. 5. No digital marketing plan. All sales are now online. Even if you meet or call a potential customer, they will want to check out your business website and connect with you on social media before they make a decision to buy. So if you have a business and a website to go with it, that’s good to help convert offline sales, but it’s not enough to get more online sales. You won’t get a lot of website visitors just because you built it. What you need is a digital marketing plan that syncs all your marketing campaigns and efforts, including content creation and marketing, SEO, SEM, PPC, SMM, email marketing, referrals, etc. Website not producing online sales? Use this website grader tool to check your website’s performance and usability, and get recommended fixes that will help you get more traffic and convert more visitors into customers.